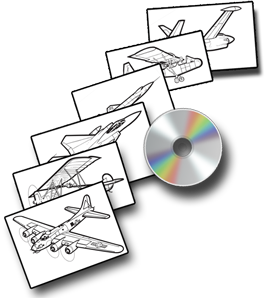 The world's greatest aircraft clip art collection. Download a sample image or two when you click on any of the twenty one groups, to see the quality you'll get with your purchase. Aeroclip.com™ is the best aircraft clipart collection in the world. It is a collection of over 2,000 strong, distinctive hand-drawn images. These planes are not generic aircraft or ghost images or any such nonsense - they are all real types and models. The producer is one guy- an art major, and retired Harrier and FedEx pilot. Twenty five years of spare time went into production. The pictures are copyrighted with the US copyright office, but good to go for your personal use. Protective watermarks go away with purchase. There are twenty-one categories representing the most popular, and many lesser known aircraft of the last one hundred years. The more distinguished types are often represented more than once. You will be limited only by your imagination in what personal, non-profit application you choose. 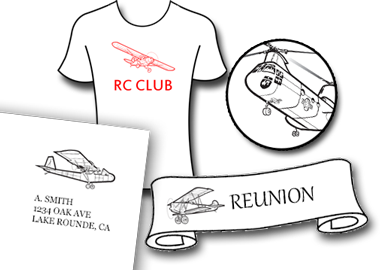 Stationary, social media, reunion, newsletter or T-shirt. Or educational activities for your kids or grandkids. The compilation is a great way to learn about and identify aircraft. Order Aeroclip today and use the drawings you choose for the personal application* you choose - all for less than a penny a plane when you order the entire collection. ﻿﻿AEROCLIP images are huge (2000 x 2000 px) TIFF images, ready for use and editing on PC and Mac. *AEROCLIP is not for distribution or commercial use.